LAWRENCE — The Kansas Repertory Theatre has appointed Peter Zazzali, assistant theatre professor and internationally recognized artist and scholar, as its first artistic director. The appointment follows three successful seasons of the professional repertory arm of the University Theatre and will provide additional creative vision on which to build its reputation. Last year The Pitch lauded the Kansas Repertory Theatre as “Best Discovery” of an emerging professional theatre, saying KS REP had officially “made our mark” on the Kansas City theatre scene. Zazzali is a theatre director, actor and scholar whose work is recognized internationally. He has acted and directed in more than 150 productions with institutions such as the Acting Company, Guthrie, George Street Playhouse, Western Australian Academy for the Performing Arts, and New Jersey, Texas and Utah Shakespearean festivals. 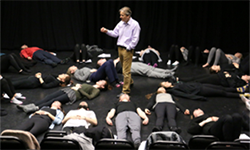 Zazzali’s scholarship has appeared in numerous peer-reviewed journals and prominent theatre magazines such as Theatre Journal, PAJ, Voice and Speech Review and American Theatre, among others. His current book, “Acting in the Academy: the History of Professional Actor Training in U.S. Higher Education” was released last year by Routledge. He is a member of Equity, SAG and the SDC. “As a director with diverse experiences at the university, national and international level, he is especially equipped to guide our emerging actors to push the boundaries of their abilities to reach new heights as they prepare for careers as professionals in the entertainment industry,” Hodges Persley said.